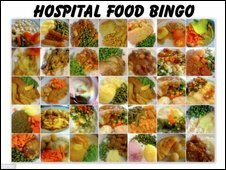 A hospitalised wit has caused a positive media ‘feeding’ frenzy with the creation of a tongue in cheek game called hospital food bingo. The 47 year old unnamed patient thought of the bingo game whilst recovering in hospital as he had difficulty deciding what ‘delights’ the hospital caterers were serving him each day without the help of his menu card. As a means of entertainment he started to add a picture or two of his daily meals to a social networking site so his friends could also try to guess the description of the strange servings given to him each day on the hospital ward. The bingo game developed as his friends could not identify the photographs of the foods that were offered to him during his 20 week stay either. The patient – a freelance journalist – is known by the pseudonym ‘Traction Man’, this is in reference to the gentleman being in traction at the South West Hospital for more than 20 weeks recovering from a bone infection. The national UK newspapers and the BBC have all covered the story of the dismal food being dished up to Traction Man but now the news of hospital food bingo has even reached as far at the US and Australia. The response to the coverage on the hospital food bingo game from the Department of Health was a curt “Good quality food for patients improves their health and their overall experience of services. Traction Man for his part has been ‘stirring the pot’ still further with the comments left on his blog regarding the food standards at the hospital. In relation to the hospital food bingo game and peoples lack of ability to tell what the dishes are that have been served to him each day he is quoted as saying “Guesses range from curry to cat sick”.